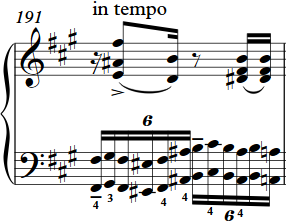 Liszt transforms in the publication for 2 pianos this "sigh" in a teasing "giggle." �sempre elegantemente.� This is a change from the initial solo (cello) to Tutti (Bassi) from flattering "legato" to brazen "Staccato" without losing the gesture of chivalrous grace. To play octaves well, it is recommended to read the more detailed notes to the 10th fugue in the Well-Tempered Klavier volume 1 (publication of the editor).�This passage may sound neither con bravura nor rumbling.�As a brief guide applies the rule: Flatter hand position for the black, steeper hand position for the white keys; random joint movement: only downwards;�Retraction of the unemployed middle finger, full meeting and deep pressing of the keys.�Fixed compliance with the octave distance between the thumb and little finger: This all while maintaining elasticity. 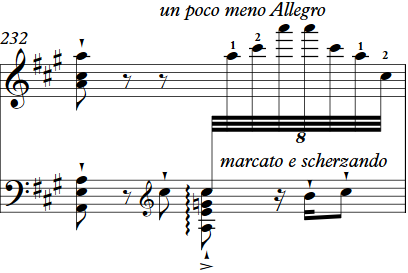 Alternating chromatic octaves for both hands at the same height;�the black keys for the one, the white for the other hand: This technique was introduced by the editor first. 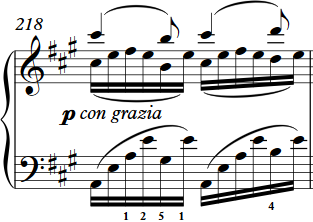 One has to approach decided on this passage.�The highest e and the lowest g sharp may represent an ideal base, From here the hands are gradualy stretched towards the middle of the keyboard.�A Rallentando should not be the intention of the player; It might nevertheless arise due to the increasing distance of the jumps course.�Despite all� the practising and contemplating this "cadence" will always remain a daring piece. The left hand quietly placed over the right hand, like playing on two manuals.�Effect: a dense (counted) tremolo. �Un poco meno allegro." This time the tempo is likely to tolerate more extensibility (yes, even demanding) than the first time.